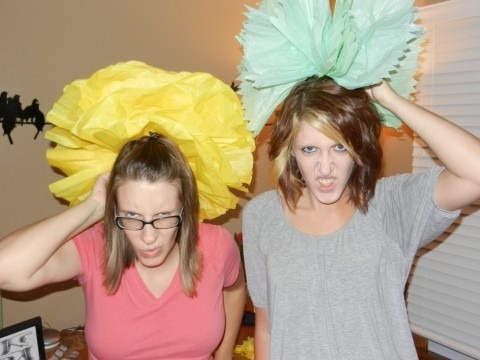 My sisters came up with this great (read: crazy ridiculous) idea to make these pom-pom flower decorations for a party my middle sister was hosting. My oldest sister made these this year for her daughters’ room and swore they were incredibly easy to do. “Oh, they’re so cute,” she said. “Oh, they’re so easy,” she said. Blah. 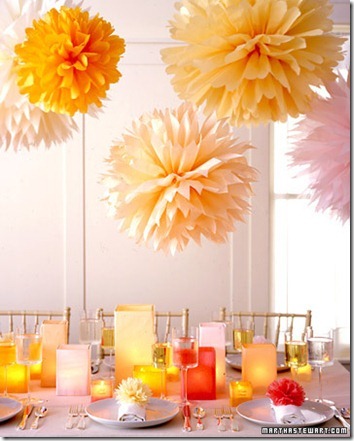 Never trust a party planner when she uses the word easy. Feel free to call me the next Felix Baumgartner because I was about to orbit into outer space at this point. Maybe I have that backwards. Whatever. It was clearly not working. And this was after my sister and I both spent a good ten minutes trying to fluff this stupid ball. We fluffed and retied and twisted and crumpled. Meanwhile, my brother-in-law sat in the corner and laughed at us. So finally, when we could take it no more, we gave up. But as soon as we did that, we had an even better idea. Yes, please. I think you can agree that . . . yeah . . . we pretty much nailed this one. This made me laugh out loud. Thank you. We made these for our wedding. Ten of them. 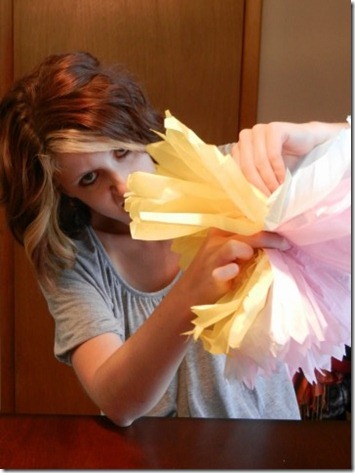 I don’t know how your instructions read, but we ended up folding 600 individual flowers and sticking them into styrofoam balls. I am absolutely certain my husband and mother-in-law had to talk one another out of stabbing me in the eye with floral wire on more than one occassion. My husband took to calling the poms “poodles” and claims he is so traumatized by the project that when he is old and deranged he will go around muttering about poodles and it will be all my fault that the world things he has an unhealthy obsession with curly-haired dogs. Some of us have fingers that just don’t DO those things. 🙂 Love that last picture. Ahah! 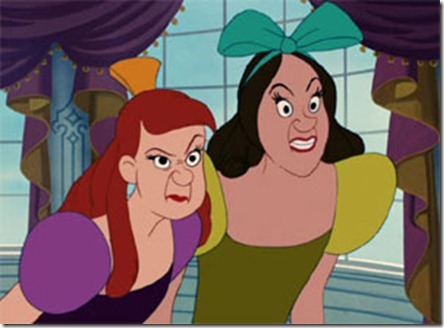 I love that last picture of you two! Kellee’s kids rooms are amazing, indeed. 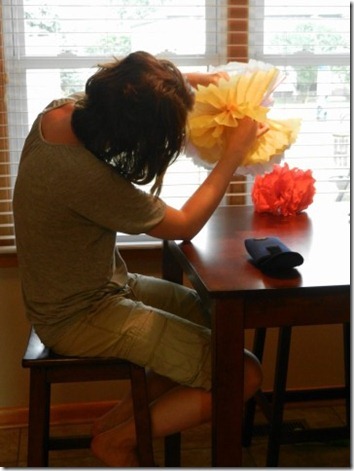 Love the pom poms…I’ve made some myself for parties…yeah maybe I should just shut up about that.